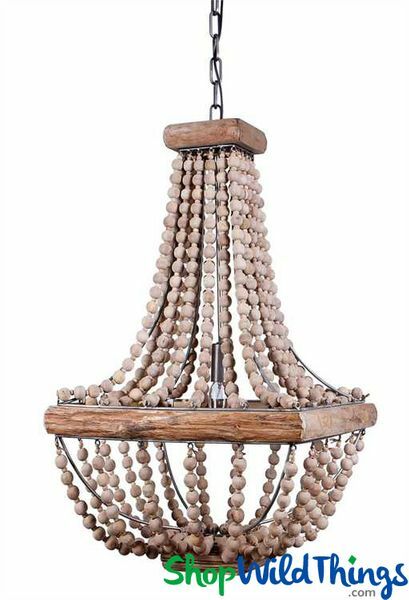 Home > Lighting > Chandeliers - Wood Bead, Metal > Metal Chandelier - Wood Trim & Round Wood Beads, 28"
Metal Chandelier - Wood Trim & Round Wood Beads, 28"
Our new Metal Chandelier with Wood Trim and Beads brings a style and flair all its own! Not to take away from round chandeliers but the square frame is certainly a unique and refreshing change of pace and this looks fabulous in rustic and urban Decors alike. 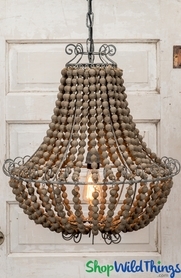 The frame, chain and ceiling cap are all matte gray and are the perfect complementary shade against the wood trim and beads. The wood trim is attached to the metal frame and the wood is made to look a bit weathered - not beat up or dented, just a naturally worn look which is a perfect choice for the wood beads. The round beads come in 2 sizes and are strung on durable jute strands. Let this natural beauty enhance any room in your house as well as a patio, an entryway, lobby, courtyard or foyer. The chandelier body is 27" long by 16" wide and there is a 2' long chain with a ceiling cap that's 4 3/4" in diameter and 1 5/8' deep with a 6" stem so the entire length (from ceiling to bottom of chandelier) is 59" long. The light shaft is 16 1/2" long and the maximum bulb to use is 40 watt, Type B Bulb, 120 volt. The black plug-in cord is 28" long and this light can be converted to hardwire by a qualified electrician. This chandelier weighs 14 lbs.